If you have been on the fence about buying an Instant Pot, this is the recipe that will make you an Instant Pot lover! I am talking the most delicious homemade chicken broth you have ever had. This soup is so flavorful and rich, you won’t believe that this starts with just a whole chicken, veggies and water. 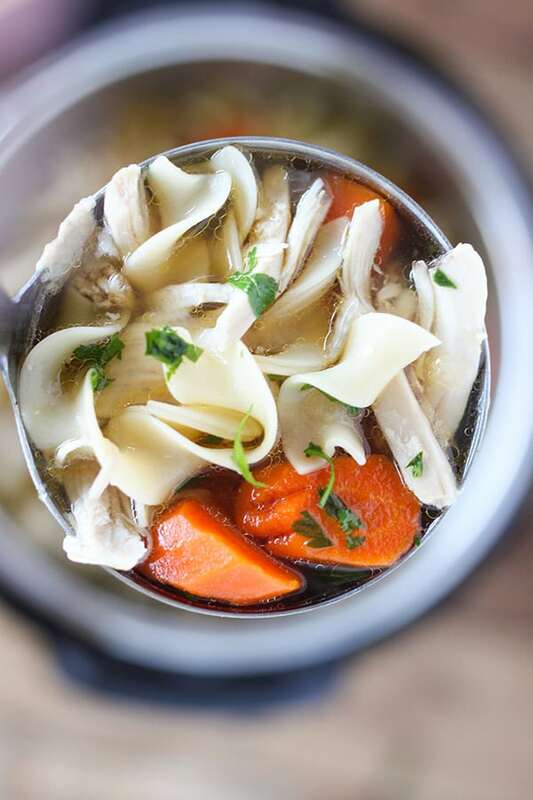 If you are just getting started with your Instant Pot, or are thinking of adding one of these handy electric pressure cookers to your kitchen, this Instant Pot Chicken Noodle Soup is a great recipe to get started with! It’s easy to make, and you won’t believe how delicious it is. 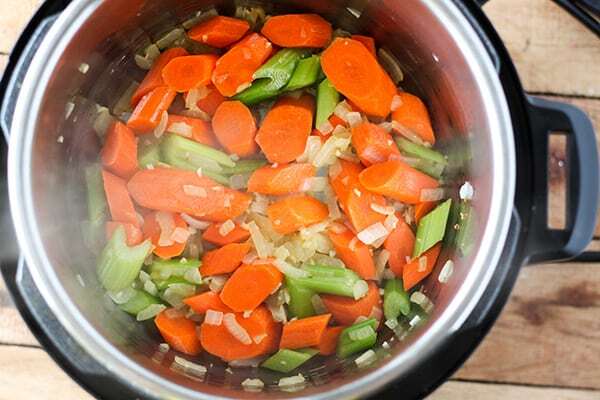 Start by using the Saute function of the Instant Pot to saute the onions and veggies. 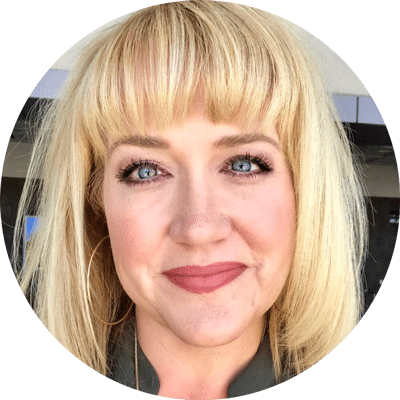 One of the greatest features of the Instant Pot is that it is truly a one-pot wonder. You can saute veggies and brown meat right in the pot. Then add the whole chicken to the pot. Mine was about five pounds. Make sure you have removed any giblets. Add 8 cups of water, soy sauce, salt and pepper. 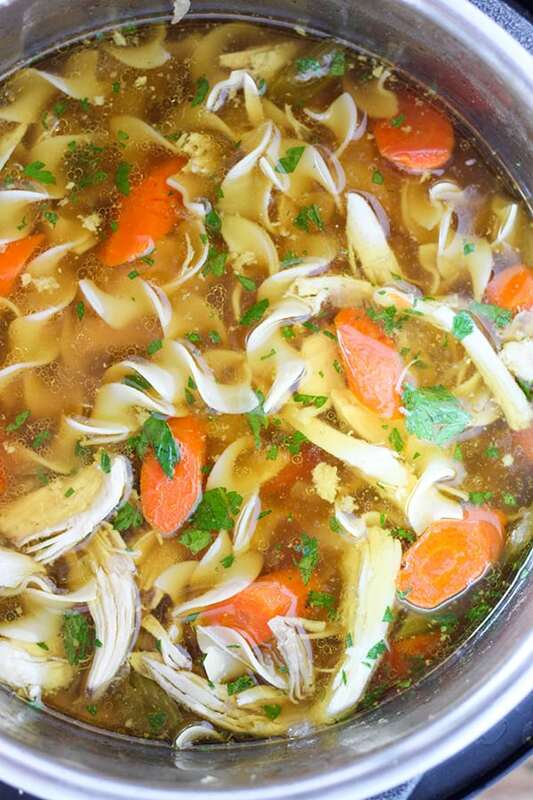 The soy sauce is the secret ingredient to this rich and flavorful chicken broth. You can’t taste the soy sauce, but it enhances the meaty flavor of the broth. Lock the lid in place and set the Instant Pot to High Pressure for 20 minutes. The Instant Pot will take 15-20 minutes to come to pressure, then it will start the count down from 20 minutes. 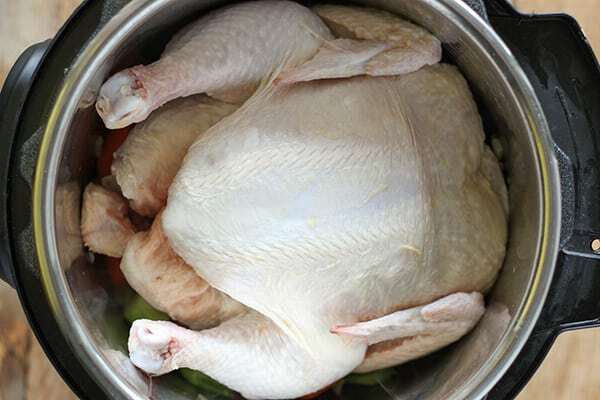 After the countdown is complete and the Instant Pot switches to keep warm function, Quick Release the pressure and carefully remove the lid once all the pressure is released. Remove the chicken and set aside to shred. 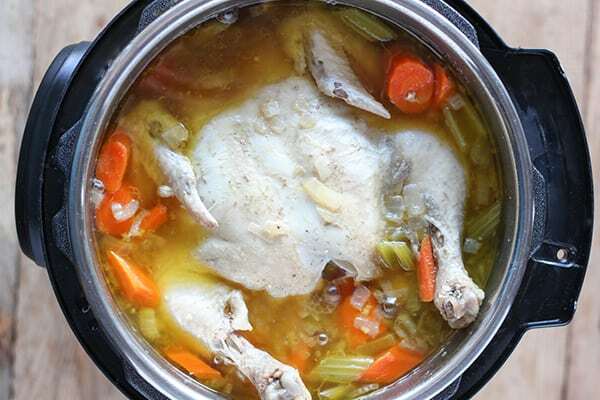 Turn the Instant Pot back to Saute and let the chicken broth come to a simmer. Add in the noodles and let it simmer for about 5 minutes. While the noodles are cooking, shred the chicken. Once the noodles are tender, add the chicken meat back to the Instant Pot and stir in the parsley. The soup will be very hot, so be careful when serving. Set Instant Pot to Saute function. Heat olive oil and onions until onions start to soften and become translucent, 2-3 minutes. Add garlic, carrots and celery and saute for another minute. Add whole chicken to Instant Pot, followed by water, soy sauce, 2 teaspoon of salt and several turns of freshly ground pepper. Turn off Saute function, lock Instant Pot lid in place, make sure pressure valve is set to sealing and set Instant Pot to High Pressure for 20 minutes, via manual mode. Instant Pot will take 15-20 minutes to come to pressure, then will countdown from 20 minutes. After 20 minutes at high pressure, Instant Pot will beep and switch to keep warm mode. Turn pressure release valve to Quick Release pressure. Carefully open Instant Pot, keeping lid angled away from you to avoid very hot steam. Remove wole chicken and set aside to shred. 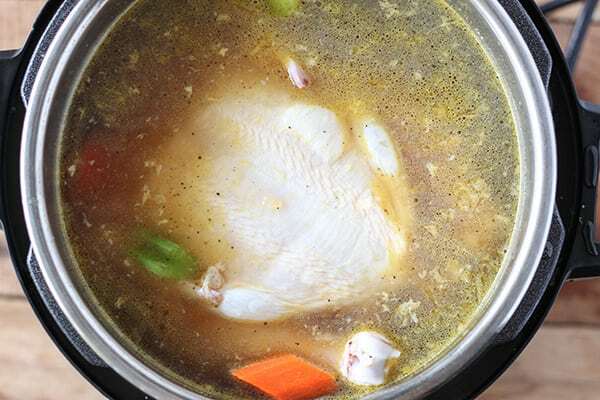 Turn Instant Pot back to Saute function and let chicken broth come to a boil. Stir in egg noddles and let cook for about 5 minutes. While noodles are cooking, shred chicken into bite sized pieces discarding bones and skin. Once noodles are cooked, stir in chicken meat and fresh parsley. 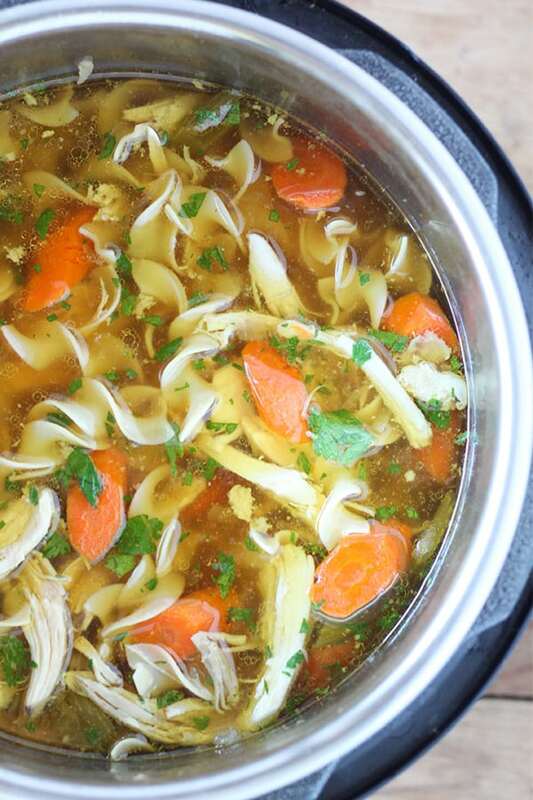 This chicken noodle soup is pure comfort food! The Instant Pot is really a must-have kitchen tool! I’m excited to share more recipes soon! 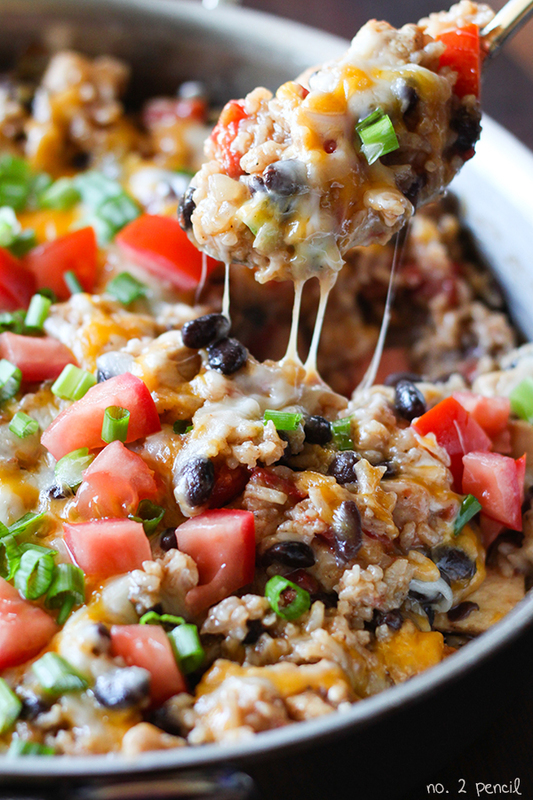 For even more dinner ideas, check out these easy dinner recipes! Looks delicious! Can’t wait to try it. We have had our IP for a few months, but haven’t made soup yet. I definitely will be giving this a try! Thanks! Thanks, Kelly! I’d love to hear how it turns out! What size IP are you using for this recipe? Looks yummy Melissa. I got my IP last month but haven’t tried soup yet. Will give it a try this week. This soup is absolutely amazing! I had alot of chicken /veggie broth and used that instead of the water and WOW! I didn’t have a whole chicken, so I used 5 lbs of chicken thighs… I’m already on my 2nd batch in less than 24 hrs!! 🙂 Thanks again! 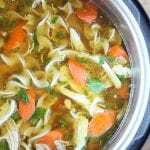 I make chicken noodle soup all the time, but wasn’t sure how to transfer it to the IP. I was worried about making the veggies too mushy. I will have to try this! I made this soup for dinner tonight and my husband said it is the best Chicken Noodle soup he has ever had. I haven’t tried to freeze it yet. Once thing I’ve noticed is that noodles cooked in the broth tend to get mushy when freezing. If you plan on freezing, maybe consider cooking the noodles separately and then adding them to the soup. Hope that helps! If you’re going to freeze soup it’s best to leave the noodles out. Just make some quick noodles while you’re heating up your frozen soup or add rice instead. I made this and it was quick and easy as promised! However, I definitely had to refrigerate and skim the fat before we could eat it, so we had it the next day. I’m just curious to know how others have dealt with the tons of fat that a whole chicken leaves behind? I’ve had this issue making chicken soup the conventional way, as well. That was the first thing I thought of when reading this recipe. Traditionally, I would skim the ‘foamy stuff’ in the beginning, then again in the end of cooking. I think what I would do here is carefully remove all of the ingredients, leaving the broth. Then skim and replace with chicken, noodles and veggies. Another way is to refrigerate the broth at which time the fat will start to solidify making it easier to remove. You want some to remain for flavor though. I’m not sure I understand why you can’t skim a broth with veggies. I just did so with no issue. You want the veggies in there during broth-making to get the flavor! I put my chicken in thinking it could be placed in there’s still partially frozen but when the timer went off I took it out and outside looked fine but was still blood you on inside. Next time I’ll have to thaw first. I put it back I need for another 20. Hopefully it won’t overlook the veggies. Hi Kimberly! I’m sorry the frozen didn’t work out. I recommend using a fresh or thawed chicken. Hope you were able to save the soup! I already made this recipe once, and it was DELICIOUS! I’m making again and was wondering what the time adjustment, if any, would be for a frozen chicken….any suggestions would be greatly appreciated!thank you! Hi Jen! I’m sorry, I’ve never made it from frozen. Please let me know if you do and what timing worked for you! Good luck! I wouldn’t recommend throwing a rock-solid bird in whole. The inside will cook a lot slower and I’m pretty sure that by the time the interior is done, the outside would be overcooked to shreds. That said, I don’t think it’s an absolute requirement to perfectly defrost it, an ice chunk here or there won’t hurt. If you’re using parts like legs and thighs, I think it’s less of an issue. This was the very first Instant Pot recipe I tried and it turned out great. Thank you! Sounds wonderful, but I am trying to reduce my salt intake. Anything else I can use instead of the soy sauce? Try low sodium soy sauce! Coconut aminos have a similar flavor, but 90 mg of sodium per tsp. My lite soy sauce has something like 530 mg. sodium per tbsp. So that looks to be about half for the coconut aminos. you can also try an few dried mushrooms (porcini, for example) or a T or two of tomato paste – they’re both able to up the umami factor…. I am making this tonight and I’d love to use rice instead of noodles. Would I treat it the same as the noodles? I cut the recipe in half for my 3 quart IP but used the time and pressure stated in the recipe. It was perfect. This is the most full flavored chicken noodle soup I’ve ever tasted. Thanks! Fantastic recipe! It’s our new favorite! However we didn’t even have a 5lb chicken and 20mins was not enough to cook the chicken through. I just made this soup for the second time, and I love it. The broth for this soup really turns out nice. I use a 3 qt. Instant Pot, so I have to cut all the ingredients in half, with one change. Instead of 4 cups of water, I used 3. I used 4 the first time I made this soup and had too much liquid in the pot come time to release the pressure (not good unless you like broth spraying through the air). When it was done cooking and time to boil the broth for the noodles, I added 1 cup of chicken broth. This brought the liquid back up to the proper amount. And I was skeptical of the soy sauce the first time, but after adding it this second time, I have to agree that it makes a (good) difference. Thanks for sharing this recipe! This was a wonderful recipe except this is a lot of chicken! I used two bone-in chicken breasts and two leg quarters (equalled less than 5 lbs total) and I didn’t use half of the meat. Not bad to have extra cooked chicken but next time I will probably use 1/2 the amount. This is delicious! I have a 6 qt., could only fit 6 of the 8 cups of liquid (all stock) to get to the max line-just added the other 2 after removing the chicken. actually too much. I used the frozen type egg noodles, The only thing I would do different next time would be to add a bay leaf or two, I love bay leaves in my soup flavoring. Thanks for sharing. I used your recipe as a nice guide and to get me started but I substituted 3 whole pheasant – I cooked them separately putting them in the pot frozen for 50 minutes on high pressure with clarified onions, celery, pepper, and chicken stock. I retained the remaining stock and used it as a base for my soup. The pheasant actually worked very well in the instant pot – they certainly were cooked all the way through, shredded nicely and were moist. I saved about 1 bird for pheasant burritos in a day or two. There are not a lot of recipes for instant pot and wild game but I have been finding that following poultry recipes for pheasant and beef or lamb recipes and substituting venison have been very tasty alternatives and it’s giving me new alternatives to making game tasty and keeping it moist. I really enjoyed it!! Thank you!! This was fantastic. I use chickens from the farmers market that are very high quality and flavorful, but pretty tough. 20 minutes plus a slow release had the meat falling off the bones, which I’ve never managed to make happen with normal simmering. The soy sauce is a great trick, you’re absolutely right that you can’t taste it but it adds depth. I left out the celery because my wife doesn’t like it, and I didn’t feel anything was missing. One note, there’s really no need to peel the carrots. Just a quick wash will do, and it’ll lend a tad more flavor with a bit less effort. This turned out great! I’ve had a few IP fails pressure cooking noodles, so I really like that you add them in at the end. We’ll be making this again! Just made your recipe. Kids loved it! Looking forward to trying more of your recipes. Do you use the soup/broth setting or the pressure cook setting when making this soup. Delicious! I wasn’t sure about adding the soy sauce, but I prepared the recipe as directed (with the exception of the type of pasta) and I wasn’t disappointed! I’m curious – do you have the nutrition information for this soup? If not, I can calculate it myself. This recipe is perfect. I used a half of a freshly butchered chicken as it was hugh. Only change I made is I always use frozen Raeman egg noodles. They are the only thing that comes close to my mother’s homemade noodles. I swear I could eat the whole pot. But have to share with the gal that have me the chicken. I’ve made this recipe many times, & I absolutely LOVE this soup… so does my daughter and anyone else *lucky* enough to get some. I always make just as you state. Today, fhough, I need to make a batch for my sick kiddo and I already had some chicken breasts thawing to make something else. To save time and use what I have on hand, I’m going to use the breasts. My question is, should I decrease the cook time or keep it at 20 minutes? I know it won’t be as flavorful without the bones to enhances the broth, but I need it quick and shredding the whole chicken takes longer than I want to wait. Im going to use chicken broth instead of water, but do you have any other suggestions to deepen the flavor? I’ve been making this recipe every Sunday for four weeks straight. 😂 I eat it for dinner throughout the week. I added bay leaves and sometimes use Worchester sauce in place of the soy. It’s the perfect way to warm up in winter! Thank you!! 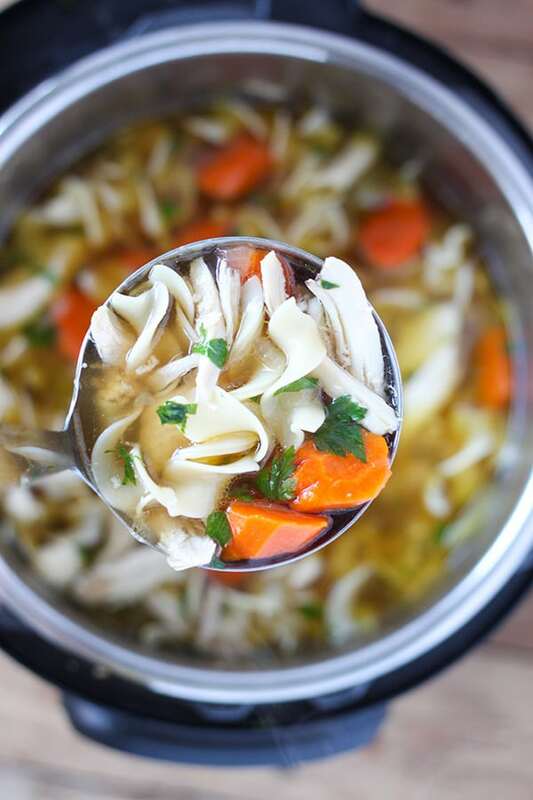 This is the most delicious chicken noodle soup recipe I have ever had and very simple! I used frozen veggie mix to cut down on time. My chicken was too big and wasn’t cooked thoroughly. I shredded/cut what I could and threw everything back in the pot for 5 minutes. Next time I will probably use breasts and thighs instead of the whole chicken – just because there was so much. If you are wanting to freeze the leftovers (assuming you have some) use a little less liquid and make the noodles separate when you are ready to eat it.